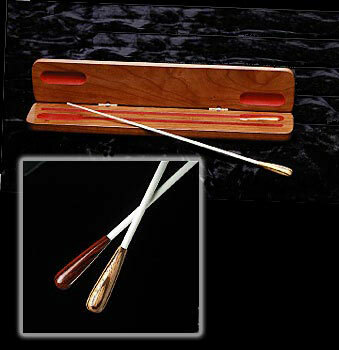 Conductor Baton Gift Set is rated 4.00 out of 5 based on 2 ratings. THERE'S STILL TIME TO GET THE PERFECT GIFT FOR YOUR FAVORITE MUSICIAN! Your choice of Walnut, Oak or Cherry Wood Case. Known by many throughout the music world, Mollard batons are without parallel for superb balance, featherweight feel and esthetic beauty. This beautiful gift set includes two 14" white shaft batons - one handle cocobolo, the other zebrawood - ensconced in a handsomely carved wood case (cherry finish pictured) lined in red flocking. Two Batons in a Custom Case. The batons may also be purchased separately in a carrying tube (see below). * Please note engraving adds 3-4 days to shipping.